Every year we have a cute little song we sing with the children during the fall. It's called Gray Squirrel. Crack a nut between your toes. Don't forget to swish your bushy tail when you sing that line. Also, we pretend to wrinkle our funny nose and crack a nut between our toes. 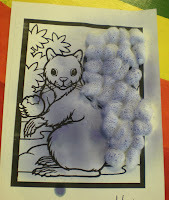 The Pre-K teacher last week had a short little craft for the children to do which went with the song. She had a picture of a squirrel. 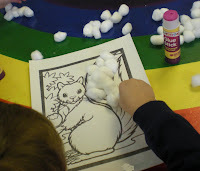 We put cotton all over his tail so he had a bushy tail. Then I had filled a spray bottle with diluted liquid watercolor. (If you look closely you will see the color is more blue/purple than gray. I didn't realize there was no black liquid watercolor, so I tried to make my own.) 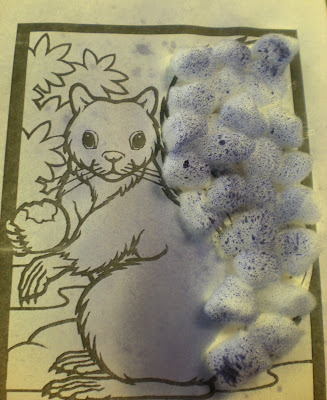 Anyway, after the tail was done they sprayed the squirrel gray. 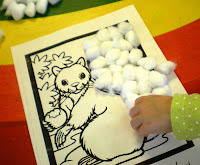 This a great exercise for strengthening their little hands for writing. On a side note you know what I was shocked at? 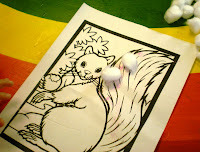 When the 3's went on their nature hike we saw a few squirrels. This was the first time some of them had actually seen a squirrel. I thought squirrels were as common as ants--at least they are around my house. Who knew? Loved the gray, bushy tails! Adorable craft & song! I'll be doing this one soon! Thank you! Love the little song! My five year old would still enjoy it and my seven year old will look at me like I'm crazy as I shake my little tail! Why do they have to grow up so fast? Hope all is well your way! Still baby growing- less than 10 more weeks! 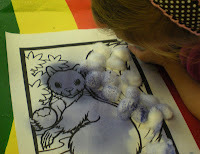 We love "Gray Squirrel" in kindergarten, too! This year we combined the poem with a nature walk to collect pinecones, which we made into peanut butter and seed squirrel feeders. To our surprise, the critters were stealing the whole feeders rather than snacking at our maple tree. The children were FASCINATED.